Since the beginning, the rally seemed to be with bad luck. First problem occured at 200th kilometre of our ride. The certificate of the auxiliary fuel tank was missing. Part of our tem had to go back to Slovakia.There was no plenty of time with no problems… Second problem was a flat tire on a trailer, but we replaced that really quick. Even that, there wan no end of our problems row. After about 150 kilometres, the second tire was flat and than we really realized that the trip gonna be hard. That time we had no chance, than buy new set of tires for trailer. We bought them, but no specifically for our trailer. Better than nothing. Since this moment, Ford had to go on its own wheels, but we had no more problems. Friday technical check, typically for Poland, was all about the lead seals. Restrictor was measured, certificates and all the paperwork was checked. Everything was okay for us and our Ford could move to closed parking lot. Here we did not expect any other problem before start, but right after we got the permission, ford refused to start the engine. After long long time of testing almost everything, we found 10A fuse, which we replaced in a minute… After all this work, our car finally started and we moved to the parking lot. At 17:45, the prologue started. Even the rain was falling hard, 8 kilometres of fan zone was full of people. The Raid Adventure team stood on the 1st place in the category. On Saturday, organizers prepared the military training field with two separate sections , 188 kilometres long. The trail was really hard, in compare to previous years, uselessly curvy. Little straight parts, many curves and holes on a surface. After the first part of test, our team stood on a 4th place. Start to second part of a day was delayed because of the terrible accident of ATV rider. After all this long day, we definitely stood on the first place again. On Sunday the schedule was telling about two 70 kilometres “fast forward” sections. Since the morning, the weather went crazy and the heavy rain was falling again. Surface was really slippery and muddy, but Danka said that more interesting than the day before. Finally, this day was a judgement day. One and half kilometre before the finish, Vasiley had an accident and because of that the trail was cancelled. Results were taken from the fifth checkpoint. Because of weather, even the afternoon start was cancelled. All this everything just submitted the first place for Raid Adventure team. 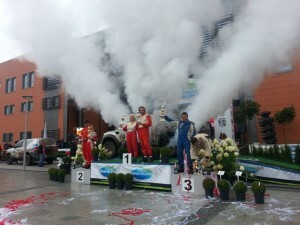 First place (in Poland) meant the final technical check. Probably, because the polish team was right behind, on a second place. Our car was prepared and built precisely. The final check just submitted our first place again. 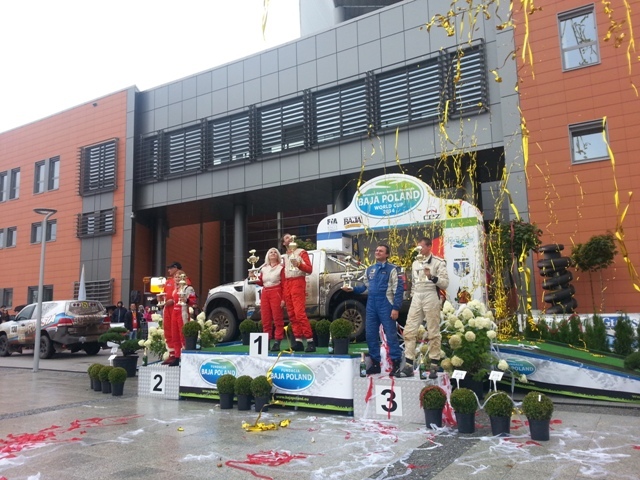 We were happy even more, because we won the BAJA POLAND 2014 FIA CEZ and we won the BAJA POLAND 2014 WORLD CUP , T2 class , also. By this way, we want to say “thank you” to all people, who supported our team.